Finger millet (Eleusine coracana) is the second of the four millets to be described in this series of posts, and the fourth most produced among them worldwide. It is a native of the highlands of the Horn of Africa, but the main producer is India. In Africa it is grown mainly in a number of countries in the east and south. Other English names for finger millet include eleusine, caracan millet, koracan, and apparently also “pampered corn.” The color of the grain and its flour is reddish (compared to the grayish appearance of previously profiled pearl millet), so yet another name is red millet. It of course has names in the languages of regions where people cultivate it, and of these probably the most common is one used widely in South Asia, “ragi“: रागी (Hindi & Rajasthani); ರಾಗಿ (Kannada); ராகி (Tamil); రాగి (Telugu); راگی (Urdu). Although finger millet/ragi is apparently cultivated in parts of West Africa, I don’t recall ever seeing or eating it there. 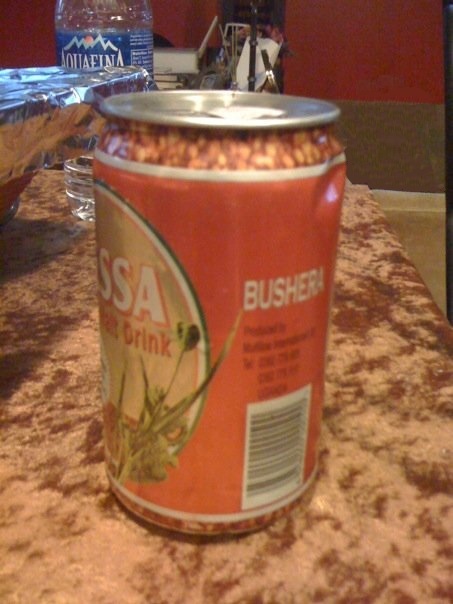 It was in Uganda that I first encountered it in the form of a non-alcoholic “millet” drink called “bushera” (a photo of a can of marketed locally is shown on left). 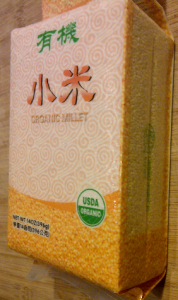 It tasted a bit different than what I would have expected from the pearl millet I already knew (even allowing for some sorghum content in the beverage). There are also fermented beers – including an alcoholic version of bushera – made with this grain. Unfortunately I did not have the chance to try any dishes prepared with finger millet from East Africa. One major use is in porridge (for two different takes on finger millet porridge with reference to Africa, see here & here). Various sources indicate that production in Africa declined for many years in favor of crops like corn/maize, but that it is on the rise again with some help from projects (Worldwatch has a good overview, even if a bit dated, and an African Research Institute article gives a good case study from Zimbabwe). the ragi grain is malted and the grains are ground and consumed, mixed with milk, boiled water or yogurt. Also, the ragi flour is made into flatbreads, including thick, leavened dosa and thinner and even unleavened rotis. It can be ground and cooked into cakes, puddings or porridges, Or, the grain is even fermented and converted to a drink (or beer) in Nepal and in many parts of Africa. The Pinterest site features a collection of recipes, many of which seem from a quick look to be from South Asia. Personal use in the U.S.
Not long after I found bajri flour in a local Indian food market, I decided to experiment with ragi from the same store – main object being something new to try for breakfasts (my responsibility on weekdays). As with bajri, I tried this with a breakfast oatmeal cooked with some ragi flour added. I found this grain has a relatively strong taste, almost tangy compared to the other millets. Also tried it with whole wheat in a bread, which worked out well, and tried a pre-made ragi crêpe mix, which was not as successful (probably user error). A ragi breakfast cereal was also interesting. Ragi as a “super grain”? As a crop, ragi is drought hardy like many other millets, and is adapted to high altitudes and diverse climates. It requires much less soil nitrogen to produce, but evidently responds well to fertilizer (not a given with all crops). On the other hand, management and harvest are labor intensive. 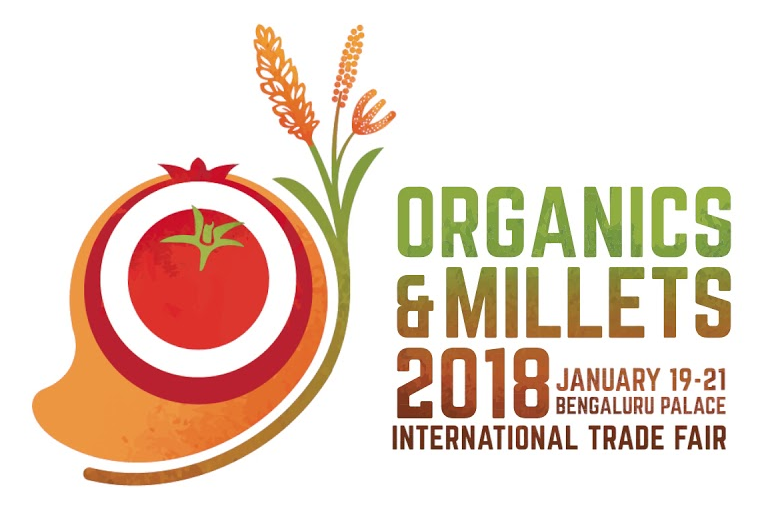 All together, however, one could imagine that ragi has an important future as a crop and food in regions like the US that do not yet know it well. Pearl millet (Pennisetum glaucum) is the first if the four millets to be described in this series of posts. 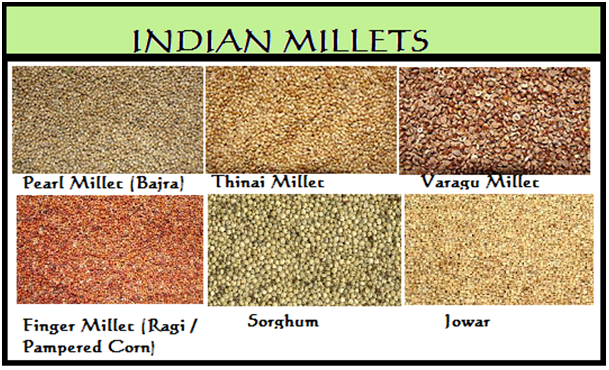 It is the most widely cultivated of the millets and the sixth most important grain worldwide. Being primarily a tropical and semi-arid land crop, it is not well known in the West. Probably first domesticated in Sahelian West Africa, it has spread throughout Africa and is also a major crop in South Asia, notably Rajasthan, India. It is described in Lost Crops of Africa, PROTA4U, Feedipedia, and the ICRISAT site. In the US, pearl millet is mostly grown for animal feed, but I wonder about expanded cultivation as a food crop in drier or drought prone areas. 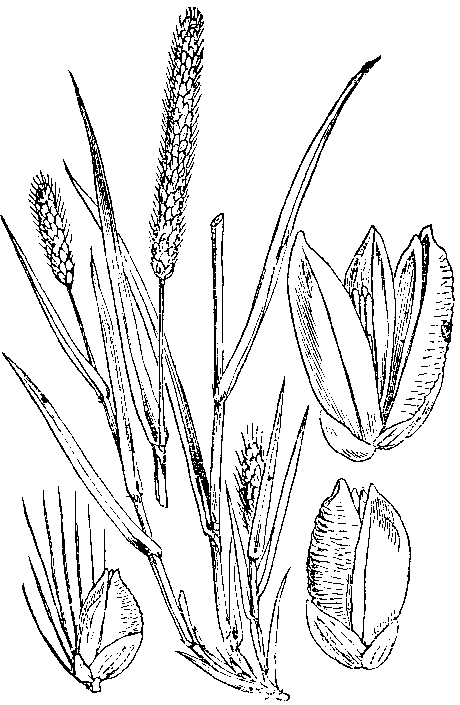 Other English names for this grain include bulrush millet and cattail millet. It has names in the languages of regions that cultivate it, and of these, the most common are probably from the Indian subcontinent: alternately bajra (बाजरा ; Hindi, Punjabi ; باجرا Urdu) or bajri (बाजरी ; Rajasthani, Gujarati and Marathi) or variations thereof. The Fulani in Mali also make a kind of dried couscous – lacciri joordi – combined with ground peanut/groundnut and perhaps pepper, to which water or milk can be added – sort of a fast food. Also in West Africa, a millet beer is also made with pearl millet – less often in a Muslim Sahelian country like Mali than in a coastal one like Togo. India is the largest producer of pearl millet in the world. The grain is a staple, one source referring to it as “the poor man’s staple.” However it is also used for non-food purposes such as fodder. Bajra/bajri appears in various foods like bhakri bread, rotla/roti bread, and idli cakes – and certainly much more (my knowledge on this is limited). It is also exported. A year and half ago I found bajri flour in a local Indian market. 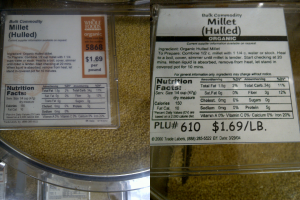 The labeling did not make clear which kind of millet it was, but from the color I assumed it was pearl millet and was able to verify that online. This was actually the first time I came across this grain in the U.S. Since then I’ve noticed it in some other international markets in Northern Virginia. Pearl millet/bajri is apparently grown in parts of the southern US, but mainly for animal feed. It would be interesting to know if any of the production is sold for food for people in the US, and in what forms it is used.